The introduction of the BeoSound 3 marked a re-entry into the field of portable radio for B&O. Their last serious work in this area had been the final Beolit models of the late 1970s, and apart from the half-hearted attempt that was the Beosystem 10 in the mid 80s, there had been nothing more in over 25 years. Text copyright © Beocentral. Unauthorised reproduction prohibited. 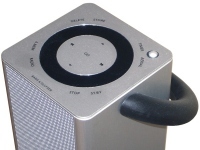 The BeoSound 3 covered the FM band only, as did many Beolits. Advances in digital circuit technique meant that now the stations could be stored and easily recalled, removing the need for much manual tuning. The tuning display was a mounted behind the loudspeaker grille, just like that of the BeoSound 1. An external antenna was not needed, a built-in rod was included that rose and retracted automatically when the set was switched on and off. Text copyright © Beocentral. Unauthorised reproduction prohibited. Beomaster 6000 and Beocenter 7700 could both do this sort of thing, but such options had not previously been available on B&O’s previous portable radios. Another interesting feature was the ability to play back music from an SD card, a form of solid state memory device that was also used in the BeoSound 2. Power came from built-in rechargeable cells, so there was no need to buy batteries, but sadly the mains charger was not built in. The unit provided was initially of very poor quality, it was similar to the type of power unit that is provided with budget portable computers and the switch-mode circuit that it contained could interfere with radio reception under certain conditions. Text copyright © Beocentral. Unauthorised reproduction prohibited. The power amplifier used was of a class-D design, similar in concept to the “Ice Power” units used in the larger Beolab loudspeaker models. The device used was capable of a maximum output of 20W but due to the small loudspeaker that was used and in the interests of battery life the surrounding circuitry was designed to limit this power to a more sensible level. Adaptive Bass Linearisation, another technique borrowed from the larger Beolab models, was also included. Text copyright © Beocentral. Unauthorised reproduction prohibited. The cabinet design was striking, and took on a novel “upright” form. As well as looking interesting, this shape also made the set easy and comfortable to carry. A plastic hook was included to allow for wall mounting, an idea that had been seen 40 years previously with the Beolit 500. Text copyright © Beocentral. Unauthorised reproduction prohibited. Sadly, not all the news was good. The most obvious failing of the BeoSound 3 was that it could not receive the new DAB broadcasts. For such an expensive model this was a foolish omission, and rendered the set obsolete even before launch. There was not even AM band coverage to make up for it, so the choice of receivable stations was small indeed. Furthermore, the SD card slot, which presumably was intended to emulate some of the functionality of the traditional radio cassette, was a playback only device, so there was no means of recording radio programmes. Sets from other makers at a fraction of the price included such things as hard disc recorders that could record and pause the broadcasts, but even at its high price the B&O could not do this. Also surprising at this price level was that there was only one (fairly small) loudspeaker fitted, a “full range” type in an internal enclosure, hardly the last word in quality! All in all, this model was a bit of a disappointment. What made its shortcomings all the more embarrassing was that other manufacturers avoided them so easily in much cheaper products. Text copyright © Beocentral. Unauthorised reproduction prohibited.